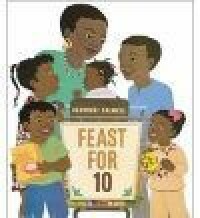 Feast for Ten by Cathryn Falwell is a good book based on math. I think it does a good job of telling a story and also including math. It is very easy to follow and the illustrations are great. I feel this book would be great as a read aloud. I do however wish the book allowed for more complex thinking for readers so that they could advance their learning. I would read this around thanksgiving to relate the book to the holiday and student's own family feasts. As I am reading this book to my class I would count the corresponding number of items on the page. I would follow this up with math centers or a math activity that supports counting up.